Web2py makes web-programming and hosting on GAE easier. An irony of being in software industry is that as I gain more experience, I go farther away from constructing software. I keep learning lots of abstract concepts, but don’t get to test them. Not to be out-dated, I write pieces of software myself to test these concepts and theories. Its like being in college continuously! Of late, I’ve been reading a lot about cloud computing, SAAS, REST and web2.0. But I couldn’t find a way to test them. 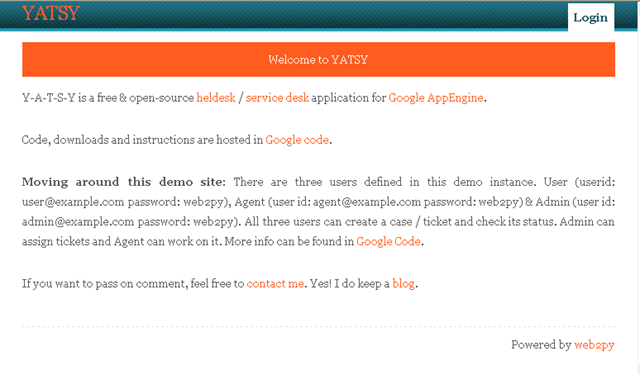 So I decided to develop an application, which I named YATSY – Yet Another Ticketing System – utilizing years of experience in customizing other helpdesk, support desk and service desk systems. Only Google offered a free hosting (limited free hosting; with an option to upgrade) on the cloud. With its current offering Google AppEngine (GAE) supports only Python. And web2py, a python web-framework, makes it extremely easy to develop for GAE. Not only that – web2py claims to make it easy to build stand-alone applications for all the three platforms: Mac, Linux & Windows. Though web2py doesn’t have many contributed 3rd party plug-ins, I went ahead with web2py because of the above feature set. One more negative about web2py is that it lacks a fine documentation. So it is little difficult for beginners. Yet discussions on their google group compensates for this lack. With that said, web2py does make web-programming easy and hosting on GAE is even easier. Here is what I’ve been able to achieve. You can see it hosted in Google AppEngine. The code is checked in my repo.